Today, the fact that human activity impacts nature and climate in a harmful manner with direct consequences on the environment, society and the economy is an undisputed scientific reality. It is vital for today’s students -the leaders of tomorrow- to understand how sustainable development can reverse environmental degradation and the climate change spiral and mitigate their tremendous social and financial side effects. 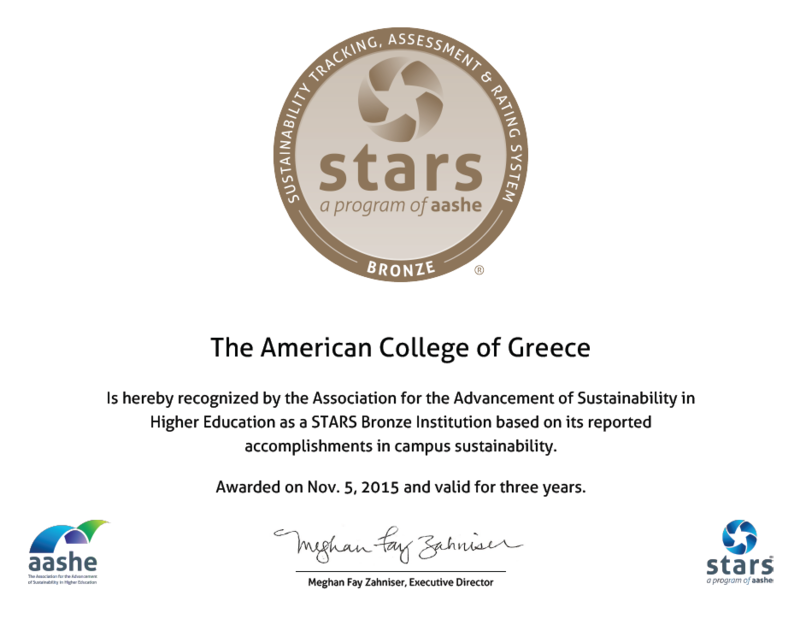 As a leading educational institution, the American College of Greece recognizes the environmental, economic, and social benefits of resource efficiency and commits to educate, inspire and empower its students, as well as faculty, staff, parents, alumni, trustees and business partners, to develop a sustainability culture and to collaborate with the local community in promoting sustainability best practices. It‘s all about forging our future. ACG aims to be a national leader in sustainability among academic institutions, by actively contributing to a more inclusive, socially responsible, financially viable and environmentally sustainable society. To raise awareness and engagement of ACG students with sustainability best practices and empower them to become knowledgeable, sensitized and responsible citizens of the world. The office of Public Affairs leads all sustainability-related activity and oversees the operation of the Committee for Sustainable Development (CSD) as well as the Center of Excellence for Sustainability (CES). Established in January 2015, the Committee for Sustainable Development aims at coordinating and monitoring strategic decisions and plans related to ACG sustainable development practices. The committee, which meets on a regular basis, comprises of representatives of all three ACG divisions. Fellow faculty, administration or staff members and students are used as resource persons at select meetings, as needed. Aiming at implementing a long-term comprehensive plan for all ACG divisions, with the endorsement and active engagement of top management, ACG has developed a documented Sustainability Strategic Plan (SSP). Through this plan, ACG aims at setting the basis for energy efficiency and reduction of operating costs while gradually improving sustainability metrics and overall social impact. In December 2017, ACG was awarded the STARS Silver Award for its second assessment, in recognition of its sustainability practices. Previously, in December 2015, ACG had been awarded the STARS Bronze Award for its first report. ACG was, at the time, the third academic institution outside the U.S. and the first in Europe participating in the STARS assessment procedure and given an award. 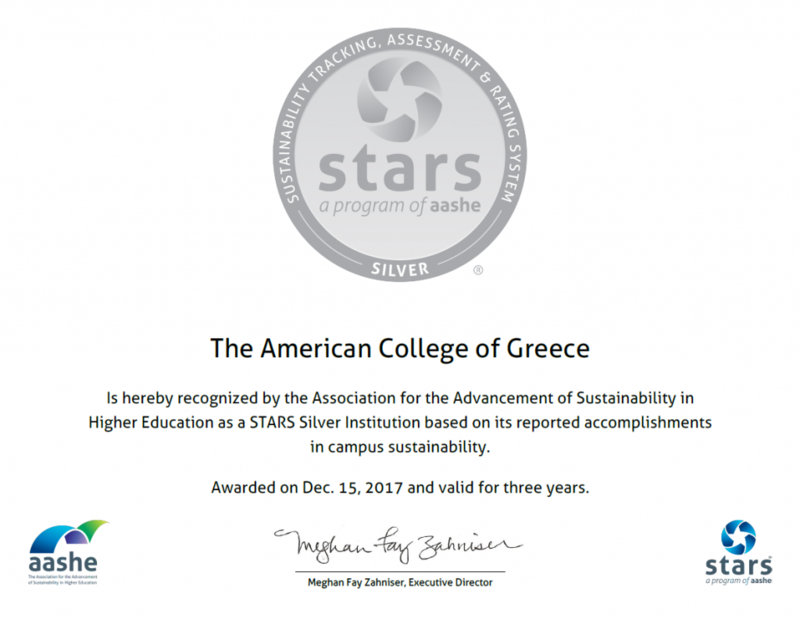 The Sustainability Tracking, Assessment, and Rating System (https://stars.aashe.org/ – STARS®) is developed by the Association for the Advancement of Sustainability in Higher Education (AASHE). It is a documented and comprehensive standard for sustainability reporting in higher education. STARS® is a fully transparent, self-reporting framework which provides a solid base to quantify sustainability performance. It is composed up of credits that span the breadth of higher education sustainability and include performance indicators and criteria organized into four categories: Academics, Operations, Community Engagement & Social responsibility and Planning & Administration. In addition, ACG has been a top performer in AASHE’s Sustainable Campus Index (SCI) of 2016, 2017, and 2018. Specifically, a top performer in the category “Wellbeing & Work” in all three SCI. A top performer in two additional categories (“Food & Dining” and “Grounds”) in the 2018 SCI. In 2018, ACG was further recognized for its sustainability efforts and best practices, being featured for the first time in the SIERRA Magazine “Cool Schools” list for 2018, aka the “greenest” colleges list and “The Princeton Review’s Guide to 399 Green Colleges: 2018 Edition”! The next STARS® evaluation for ACG will take place in December 2019. 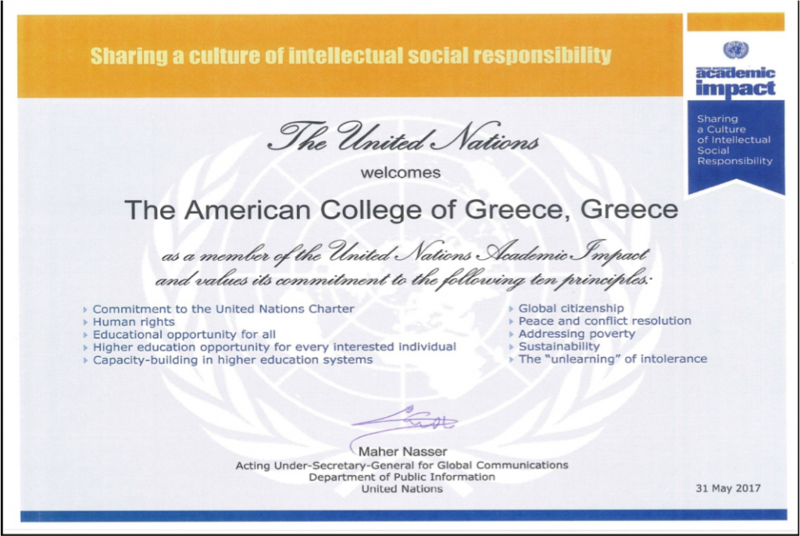 As of May 31st 2017 The American College of Greece serves as a member of the UN Academic Impact. ACG joined over 1000 academic and research institutions in more than 120 countries that are members of UNAI. 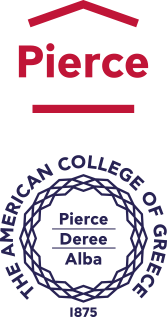 In Greece, ACG is the fifth academic institution to be a member and the first and only one private. 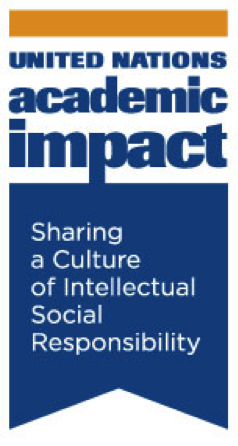 The United Nations Academic Impact (UNAI) established in 2010, is a global initiative that aligns institutions of higher education with the United Nations in promoting its global priorities, including peace, human rights and sustainable development through activities and research in a shared culture of intellectual social responsibility. Each member institution is required to carry out at least one activity in support of UNAI and its ten principles during a calendar year and submit an annual report. These activities will also be highlighted in the UNAI Newsletter and on the UNAI website. A commitment to promoting inter-cultural dialogue and understanding, and the “unlearning” of intolerance, through education. For the year 2017-2018 ACG has committed to systematically carry out at least five out of the ten principles i.e. 2,3,4,6,9 as listed above. As of 2018 The American College of Greece serves as a member of the UN Sustainable Development Solutions Network (SDSN) joining institutions and organizations, including universities, research institutions, foundations, civil society, in a unique network of problem solvers aiming at contributing to practical solutions for sustainable development. The UN Sustainable Development Solutions Network (SDSN) was established in 2012 under the auspices of the UN Secretary-General. SDSN mobilizes global scientific and technological expertise to promote practical solutions for sustainable development, including the implementation of the Sustainable Development Goals (SDGs) and the Paris Climate Agreement. As of March 2018, ACG has become an official Member Organization of SDSN Youth. SDSN Youth aims at working together with its Members Organizations in order to educate and empower youth globally to achieve the UN Sustainable Development Goals (SDGs) and provides opportunities for them to create sustainable solutions to the world’s biggest challenges.